2 RS232 serial ports, for connection to printer, PC or PLC, radio module, and optional interfaces. 1 RS232 serial port (optional RS485), for connection to repeater, remote scale, badge reader or digital load cells. 4 (16 in the IO versions) optoisolated outputs (optional). 2 (8 in the IO versions) optoisolated inputs (optional). 4 independent analogue channels (up to 2 in the E-AF03 version, 1 in the E-AF09 version) for reading of the weight. 110-240 Vac power supply; built-in rechargeable battery for use in prolonged absence of the power mains (incompatible with IOEXPB board). 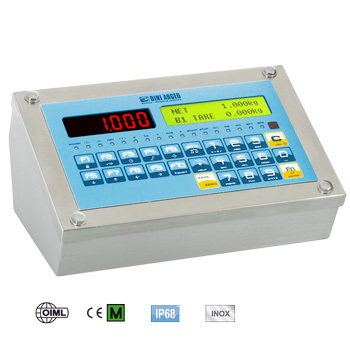 3590EXT01BC Weight indicator with 2 IN, 4 OUT, RS485 and AF01 software. Stainless steel IP68 case, 25-key keypad, LED display and backlit graphic LCD display. 3590EXT Indicator with AF01 software. Stainless steel IP68 case, 25-key keypad, LED display and backlit graphic LCD display. 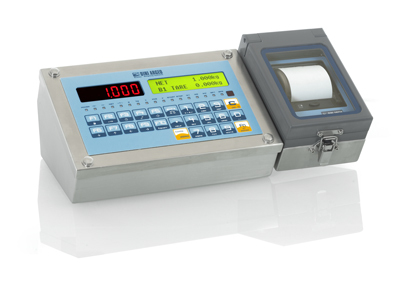 BELT Software for reading/regulation of the flow on the weighing belt. TPRXT (S1) Attached stainless steel IP65 thermal printer. NOTE: incompatible with IOEXPB board. IOEXPB (S1) Built-in board with 12 OUT and 6 IN (mounting and cable gland excluded). It includes expansion circuit of the power supply range of the indicator (8-40Vdc). NOT COMPATIBLE WITH 3590E4CH AND TPRXT. With UL marked PCB, Terminal block, plastic box and labels (if expected). OBCLTI (S1) Stainless steel 3 way control light (for indic. with relais output). For attached mounting to the stainless steel indicators of the "XT" line. Connection cable and power supply from indicator. PG7M 10 PG7 metallic cable gland set for weight indicators.